The net is full of these debates, but apparently there are not enough of them. So here is the appropriate thread. Did your initial post get washed away by a tsunami? I know it won't work. I have my own views on anthropogenic warming issues, but I have learnt that the subject is so polarised on-line debate is pointless. Each side leaves the exchange further convinced of their own righteousness and the stupidity of the opponent. Love the word choice, InvisibleLog. My question is whether the Arctic is having it warmer than usual this winter. With melting glaciers and reduced snowfall what are the best prospects for new orienteering terrain? Haven't seen January numbers yet; December was generally warmer than usual in the Arctic, but the really spectacular anomalies were a bit further south in Siberia, which was up to 10C above average (much further above than the central US was below). There's also been some exceptional warmth in eastern and central Siberia in the last few days ('exceptional warmth' being a relative term to describe a record high February temperature of -12C in a place, Oymjakon, where the average at this time of year is about -45). Incidentally, even in the continental US, when the final January number comes out I'm expecting it to be only slightly below normal; central and eastern states have been cold, but the west (especially California) was very warm. And, going back to the original subject of the previous thread: according to a Facebook post by NOAA's head of climate monitoring, there's no evidence of a trend in the number of ice storms in the US, but there are indications of an upward trend in their maximum potential moisture (and hence peak ice accumulation). @guskov - yes, it is. @randy - if you want to engage in a substantive discussion of the evidence for anthropogenic climate change, please start by telling me which organization's temperature data you trust and therefore relied on when you stated "This winter is 7% colder than the historical average." Please also tell me what geographic area that statement applies to (Hint: since all the major global temperature indices, from surface and satellite observations, already reported positive temperature anomalies for December and all those that have reported January numbers also came in positive, any credible answer will have to involve some area smaller than the whole globe). If you just wanted to rant about the evil motivations you imagine lurk in the hearts of environmentalists, mission accomplished. I hope it felt good - I very much doubt it convinced anyone that your position is based entirely on careful, unbiased consideration of the available evidence and not at all on an emotional reaction to perceived unfair criticism of your lifestyle. My brain has melted as a result. Can I attribute that to climate change? How are the Slovenian forests looking? Debate? What debate? When you live north of 60 you very much experience the reality. Ask the First Nations people and others living out on the land. TIL is 59 so he's almost there. What about those North of 70? All I know is I had some beauty weather working up there in Summer 2010 and 2011. Although in retrospect it should probably never be warmer in Inuvik than Miami. Another weather day off from work where I live. In this discussion I think it is essential to distinguish between "climate change" (easier to document and agree on), and "anthropogenic climate change" which is a very loaded term, involving cause and solution. The "anthro" version is where the debate legitimately resides, and research needs to continue. I'll suggest that extremists on both sides detract from their own cause, by making easy targets for their opposition, on personal and rational levels. "This winter is 7% colder than the historical average. Unlike global warming, that is an actual, documented fact that you can look up on this new thing they have called "the Internet". " That is probably the strangest statement that I have ever read in connection with this debate. It's not surprising. Randy is stupid. Yes, Randy, I am personally insulting you. Among others, haven't Coase and Pigou given us a number of tools to address some of Monibot's concerns? Dunno aren't you the economist? ;-) Given that anthropogenic climate change is an issue that is multi-governmental, global in scale, multi-generational has uncertainties in projections which increase regionally I'd say it probably doesn't. But I'm not an economist so I'm curious to know the answer. Sure global warming is real. But it is just a smokescreen to distract people from the real problems in the world, such as peak oil. Globalization and unconventional fossil fuels don't solve this problem, they just make the pot bigger until we are all in. I am intrigued by the application of per cent measures to temperatures... Fahrenheit, Celcius or Kelvin. I suspect only the latter would make any sense as it has a meaningful zero measure. Seven per cent of that would be quite startling. That is only one of the things that I thought was strange. I resisted saying stupid but it did indicate something about the author's competence in discussing climate change. Prove to me that my valuation is unreasonable. Thanks for the X in the rightmost column, Ken. Who is this Randy fellow and why can't I see him? tRicky, you may find the Randy Rant in the Slovenian Forest thread. I don't think randy is stupid. He's quite smart though clearly not applying himself very much to the task of coming up with plausible sounding arguments why global warming is bunkum - it's not as though he'd even have to do any original thinking, just read what's already online, although admittedly it could be quite a lot of work finding the relatively sophisticated arguments among the vast swaths of commentary from scientifically illiterate people who are certain they know more about climate science than the overwhelming majority of climate scientists. "For those who shivered through January, this may be hard to believe: Nationwide, the average temperature for the month was about normal because a warm West offset a cool East. January in the Lower 48 states was the 53rd coldest of 120 years of record-keeping, the National Oceanic Atmospheric Administration announced Thursday. The average was 30.3 degrees, only one-tenth of a degree below normal for the month." Update, Feb. 14: NASA GISS just reported its January global temperature number, 0.70 degrees Celsius warmer than the average January from 1951-1980. That makes it the fourth warmest January in the GISTEMP Land-Ocean Temperature Index record. December last year was also the fourth warmest on record. The combined Dec-Jan period is the second warmest on record. Results may, of course, be slightly different in other global surface temperature datasets and somewhat more different in satellite-based temperature datasets. An estimate of perceived national average temperature can probably be calculated by using a spatial population density weighting on top of what I assume is a usual kriging approach. In Australia a vast unpopulated and very hot interior might mean we would see important differences between the two estimates in some years. Not this year though. The vast hot interior has been a regular visitor to populated areas. In this discussion I think it is essential to distinguish between "climate change" (easier to document and agree on), and "anthropogenic climate change" which is a very loaded term, involving cause and solution. The "anthro" version is where the debate legitimately resides, and research needs to continue. " Research certainly needs to continue but this isn't quite accurate or it's at least overly simplistic - what debate there is within the community of working climate scientists isn't over "anthro" or not but over how much of the observed increase in temperature is anthropogenic versus caused by variation in other factors and how much more anthropogenic warming we should expect. Even the contrarian climate scientists Republicans invite to congressional hearings - the Richard Lindzens and Roy Spencers and so on - and people like Christopher Monckton and Bjorn Lomborg will concede that a significant part of the already observed warming was caused by human actitivity and that there is more of that yet to come. Their claim these days is that the warming still to come isn't going to be big enough to be worth a lot of effort and expense to avoid, not that there hasn't already been anthropogenic warming and won't be more in future. 1. There is this misnomer of calling it Global Warming, well yes it is, but people associate LOCAL temperature with Global Temperature and on such a short timescale. Climate Change is the better description. 2. General public understanding of science (and in particular statistical interpretation of data) is awful. Political posturing is often based on misleading statistics and distorted facts - partly because it's misunderstanding and partly because there are a lot of rich people/companies who stand to lose the amount of money they'll make in the next 50 years if we force the required rapid change in behaviour, so they exploit the public misunderstanding, and essentially throw enough mud to make it into a debate. It's not a debate, climate change is happening - definitely - the data is clear on this. There is very, very, very good evidence for human-induced climate change, but there is still room for some doubt (which is normal in science - again this is a misunderstanding of how science works). The issue is not whether it's happening, but whether we're going to do anything about it. Given the debates in the US, it seems that most of your politicians are worse than the lot in the UK, although we're rapidly swinging to the right in this country, where business is king and we worship the holy might of GDP at the expense of everything else. Too much short term thinking from politicians and not enough long and medium term thinking. Plus China is kicking in now and India won't be far behind. Yep, we're a bit f***ed. It's okay; future generations can deal with it. But isn't there anything we can do about Climate Change? Well speaking of "future generations" brings up a way all of us Americans can help reduce future Global Warming: by not having a future generation! Remain childless! Sadly, the United States stands today as one of the eight countries expected to account for half of global population growth between 2013 and 2100. The other seven are: Nigeria, India, Tanzania, Congo, Niger, Uganda and Ethiopia. But citizens of those other seven countries burn very little fossil fuel compared with the average American. So for every American not born, vast quantities of carbon will remain buried in the ground instead of up in the atmosphere, warming the planet. The US needs not only an Immigration policy, but a Population policy! But with current popular American sentiment, neither is likely to happen. Americans still love kids; each new birth is cheered and encouraged. Meanwhile Japan is held up as a failing country, partly because of its declining population and slow-growth economy. But an article in the New Scientist last month entitled Japan's aging population could actually be Good News disputed that notion. ...Japan has the world's oldest population, with a median age of 46 years, an average lifespan of 84, and a quarter of the population over 65. But this doesn't have to mean a gloomy future. What happens in the coming years might even point the way for other countries...Hard-working Japanese society has "embraced voluntary mass childlessness" One in four don't have children. The conventional view is that this is bad news: shrinking numbers hobble economic growth and the ageing population is a major financial burden. But the proportion of Japan's population that is dependent on those of working age isn't unusual, it's just that it has almost twice as many over-65s as children. Consequently Japan spends less on education. chitownclark: I think going childless is a little bit fatalistic and extreme. However, any attempts to address climate change that do not address population and global wealth distribution (which leads to high birth rates in third world rural areas) will be a total failure. High fossil fuel prices and carbon taxes might make some of these problems worse when they lead to escalating food prices because of the fuel costs of production and transportation. Fighting global poverty and inequality, having a diversified energy policy that can shift away from fossil fuels, and car-free communities and lifestyles are all part of the solution. Ultimately, we need a new global economy that rewards long-term thinking and strategy compared to the current one that rewards resource extraction, population growth, and exploitation of cheap labour. Properly pricing social and environmental externalities would cause this shift immediately. El Chucko, we're honored that you've posted six of your 11 posts in the past 12-months to this thread. Thanks for your interest. And I only wished to point out that each of us can affect this curve, whether in the Green or the Red areas, by simply finding other things to do with our lives than produce and baby-sit the hungry and sharp-toothed members of the next generation. The relative stability of mating behaviour and the lags between demographic behaviour and demographic outcomes mean demography is perhaps one of the safer contexts in which to use extrapolation on human behaviour... unlike economics. Often on AP, especially in threads like this, I wonder what is the point? The perspective and arguments are so consistent, the ontic assumptions and experiences so similar, and the voice so uniform that semblances of an alternative viewpoint such as provided by Randy (or me, I suppose, should I forget my vows of monastic silence) are blown away like wisps of smoke from a candle. Why bother putting together all these artful phrases? Why trawl so hard for obscure facts? Why try hard to advance valid arguments, supported by data? What is everyone rehearsing for if there is nothing more than preaching to the choir? But then, thank God, chitown chimes in, and it all makes sense. Everyone else is so reactionarily paleothic in comparison. Sometimes I wonder what group does more damage to the climate change debate. Passionate environmentalists that write a bunch of junk or denialists that write a bunch of junk. It almost seems that the more incorrect the denialist claims become (such as their incorrect statements that there has been no warming since 1998) the more extreme the passionate environmentalists statements become (such as creating or exaggerating or attributing crises). The denialists need these incorrect claims by the passionate environmentalists as their way to deliberately delay needed action on reducing greenhouse gas emissions. Why? Because the denialists have no logical argument against the climate science and therefore can no provide no logical 'alternative viewpoint' that makes any scientific sense (without breaking laws of physics of cherry picking data). So instead the denialists pick on the bad (and incorrect) 'off the cuff' remarks of environmentalists that get the science wrong. They then use that as a soap box to then make incorrect statements that there isn’t data to back up the climate science. By doing so they are either being untruthful or ignorant. J-man is probably correct in his statement “what’s the point”? Each of these groups are most likely not going to change their manner or beliefs. Many are set in their ways. In many ways the denialists’ political beliefs may often be such that they MUST deny climate change. Similarly, the solutions that some passionate environmentalists propose are just not feasible. I just wonder where each of these groups go to get health and medical information? If they listen to medical doctors then why aren’t they listening to climate scientists? As rf_fozzy eloquently wrote above - the general public just doesn’t understand science and the scientific method. That ignorance is (and will continue) to cost society greatly. And by making that statement I’ll probably be labeled as an ‘elite’. Looking back on the other thread (and from a science perspective) it is worth mentioning that it is indeed careless to attribute a particular weather event to global warming. BUT, it is important for readers to know that there are also good examples where particular extreme weather events, such as the 2010 heat wave and wildfires in Russia, that have been scientifically attributed to global warming. For example, Hansen et al. (2012) published a paper in PNAS where they wrote: "we can state, with a high degree of confidence, that extreme anomalies such as those in Texas and Oklahoma in 2011 and Moscow in 2010 were a consequence of global warming because their likelihood in the absence of global warming was exceedingly small." WIth all due respect, and I may regret this, (jtorranc will pounce because I misstate an argument, I will open another can of worms after all those nematodes finally scurried away on a previous thread sometime ago, etc.) but I think we can try to do better than bandying about loaded terms to frame debates, e.g., denialists, homophobes, babykillers, birthers, whatever, because they deliberately ascribe beliefs, positions, etc., that the targets need not hold. On a different side of the debate than the one argued so convincingly here, there may be a group of people who have some views which could be described as libertarian and who just don't care about climate change per se, and therefore neither deny nor affirm it. It just doesn't affect them. While you may impugn them, belittle them, spit on them, or institutionalize them, it is not correct to paint them all with the brush of denialist. Also, I don't believe that a libertarian must deny climate change (implicit in my assertion that someone that has some characteristics of being one doesn't care, and is therefore not denying it), but I suspect jtorranc may be able to advance an argument why it is so. Clem, if we can hypothetically suppose, for a moment, that you have a potentially terminal problem, it's hard for me to see how declaring that you "just don't care" is very much different from being a denialist. Please restate. P.S. Not, as far as I can see and correct me if I'm wrong, that anyone in this thread mentioned libertarians or libertarianism before you did. Also, setting aside for the moment some of the other terms you object to for a moment, how is "birther' a loaded term? As far as I'm aware, it didn't have any meaning in common usage before sometime in 2008 or 2009 so I assume you aren't claiming that it somehow constitutes likening people to Nazis, as the exceedingly weak argument against the use of the terms "denier" and "denialist" in a climate debate context generally does. If it qualifies as a loaded term, as far as I can see the load was placed on it entirely through the actions of people who against all evidence claim that the circumstances of Barack Obama's birth make him ineligible to be president - the same group of people to whom the term has, so far as I can tell, been narrowly applied as long as it has existed. I don't see where this ascribing beliefs to people that they don't necessarily hold you thing the use of the term entails is happening..
@brendan: as I suggested, we've covered some of this ground in some other thread which I am too lazy to dredge up. But, I will describe my thinking differently here instead. I am not smart enough to do that, but that's OK. I flit through a world of human beings. I have seen in my profession smart people like those here import their toolkits to predict outcomes a few moments in the future. What do you think their margin of error is in a month, in a year? Let me assure you, there are far fewer people in the world who can predict the future than just the experts on climate change who are represented here. And yet, when confronted by this alleged existential problem, I am expected to accept that the future can be predicted. That this incredibly indeterministic system (the interaction of a species with a planet over time), whose complexity exceeds that of weather and climate and everything else that experts here can be expert about? It is just so presumptuous. Anyway, we can go on and on. @jtorranc: am I Batman or the Joker? "What would I do without you? Go back to ripping off mob dealers? No, no, NO! No. You... you... complete me." Sorry, I digress. This post http://www.attackpoint.org/discussionthread.jsp/me... is technically before mine. Can I not assume if someone links to something it is supposed to be germane? Perhaps intimated to supplement one's own arguments? Maybe not, but I have to admit, when I make seemingly obscure references, they are rarely random. @jtorranc2: yes, you got me. I was too lazy to come up with other loaded phrases. I knew birther wasn't a good one. I can assure you I have no dog in that fight. I'm sorry you had to expend more joules attacking it than it warranted. @jotorranc3: there must be a lot I missed. Sorry. @j-man: It is relatively easy to predict the distribution of gas molecules in a box a year in the future. It is impossible to say where a particular molecule will go moments in the future. One can identify conditions likely to generate avalanches, hurricanes, typhoons etc without predicting their exact locations or paths. Is this predicting the future? - an increase in average temperatures leads to increased frequency of hurricanes, for example. Sure, I have trouble believing that any particular climate model is rigorously justifiable, not just because I'm a mathematician. But, I can hope that the more egregious models get discredited, and that the remaining ones can be used to formulate a range of likely possible behaviour, so humanity can prepare for what may come. developed to underdeveloped countries is? @j-man - okay, I'm not in the habit online of automatically following links offered with no description beyond "Some good reading", not even when Hammer offers them. Why do you disagree with that analysis? Do you not accept the premise that libertarians are strongly concerned with property rights? Do you not accept that pollution can impinge on other people's property? It's all very well to say Pigovian taxes could deal with the issue (I don't have any idea of Coase's contribution - I'll presume that may be worth a bit of my time at some point) but the actual libertarians or people who claim to be libertarians in the world don't, in general, seem to be championing them - saying their reflex is to deny that a problem exists that ought to be dealt with seems to me to accurately describe their actual behaviour. Please, enlighten us as to the errors of Breunig's thoughts. @j-man - BTW, are you standing by "homophobe' as a good example of a loaded term? That whole objection looks very much to me like a case of, when the evidence isn't on your side, retreating to complaints that other people are being uncivil in saying the evidence isn't on your side (look up Ian Plimer's debate with George Monbiot for a more than usually pathetic example). What term would you suggest in its place? The trait of hating homosexuals definitely exists and a term is sometimes required to refer to people who exhibit it. OK, clearly I'm the Joker around here. I guess jtorranc will have to be Batman. @ndobbs--sorry I so inarticulately expressed my point. My point was not that I don't think that the scientists here or somewhere else can't predict climate change, and weather to some degree, but that their tools and derring do can't do anything to predict how the course of human history unfolds--over minutes, or decades. Which scientists anticipated the extraction of oil from the ground in Titusville just 150 years ago? What scientist then anticipated all that fission 90 years later? Sure, there were signs for some, but 10 years out? Let's be honest, those outcomes were highly speculative. I know both of these things are scourges of the Earth, but come on, they are pretty transformative energy sources. Unless we start killing ourselves off (a la chitown) or retreating to our caves (an exaggeration of some other people's views) humanity has the ability to come up with alternatives. All things equal, a stronger America and China, with more people, IMHO, are better placed to develop those than eviscerated versions. @jtorranc1: you don't speak for all environmentalists, do you? Otherwise, I will demand you defend everything chitownn says. Similarly, if I were a libertarian (I have intimated as much as I am inclined already about this point) I would not speak for all of them. In any case, I think acknowledging something like climate change and saying "so what" could be logically consistent with the librarian view, contrary to that guy's assertions. @jtorranc2: do I have to respond to that? It has nothing to do with this. Wasn't it sufficient to illustrate a general point. Or, is it really just that you want me to say "uncle"--"YES! I am a denialist!" @jtorranc3: Do you really see me as the Joker? Why don't you go after jj or someone? Anyway, this all proves my point, or at least affirms my question much earlier? Why do you need to fluff your feathers so much to scare off little me, a single gadfly, a little faux-Socrates? Aren't you in the midst of people who need to hear this? Randy and I (jj, too) as profligate as we clearly try to be, aren't going to move the needle personally. Nor do we establish policy. So what is this all about? J-man.... it just so happens, that I'm partly on your side here. I'm an environmental scientist. Not in the climate field... but close enough to appreciate how complex earth-systems are. My experience with science tells me to be very skeptical of our ability to predict what the climate will look like 10, 20, or 30 years into the future. I think that a lot of climate scientists would probably be willing admit the same, if doing so wouldn't empower those who are constantly attacking the validity of their work. I would like to point out though, that while you argue that the uncertainty of scientific prediction dictates a position of "lets wait and see", I actually believe this uncertainty should be motivation for more dramatic, and rapid action. That is a hard sell to the world's political leaders. In a modern economy that fetishizes maximum efficiency (probably a hangover effect for the national narrative about how capitalism won the cold war), scientists are now asked to present arguments for the economic cost of climate change. The assumption, I guess, is that world leaders should then cut back CO2 emissions just to the point that the cost-benefit ratio is minimized (and no further). But now, I'm going to sell the idea to you, that the potential costs of ignoring climate change are far-far-greater than you ever imagined, and that you should be erring on the side of caution... rather than shooting for maximum efficiency. I argue this, because the earth represents a "complex-non-linear system" (in science jargon). These systems don't behave like simple systems. In simple systems, you push it a little it budges an inch, push a little harder, it budges two inches. In complex non-linear systems, you can push a little and things stay put. You push a little harder, and all hell breaks loose. Human society depends upon climate stability... the moderate climate of the last two millennia has been fundamental to the development of modern civilization. But if we push the climatic systems too hard.... well, I sincerely hope that hell freezes over before we get another snowball earth . Now, I don't expect another snowball earth (it's still controversial whether that even happened). However, I do think it's informative to look at recent geologic history and consider what scope of "phase transformations" are possible (likely?) to occur in a destabilized climate. Here it goes. Did you know that ~20,000 years ago the sea level was 300 feet lower than today, and much of our favored orienteering terrain (including Canada, New York, and Chicago) were covered by the Laurentide ice sheet... essentially uninhabitable? This is why scientists 30 years ago were so concerned about global cooling!!! Conversely, did you know that complete melting of the Greenland ice sheet (a possibility... not a probability), would result in sea level rises of >20 ft? When you start pushing around this particular non-linear system... you are playing with some serious fire. J-man, I want to acknowledge, you are right that we shouldn't neglect our economic health entirely. Unexpected problems will arise, and economic strength will give us the power to deal with them. (For example, our economic vitality gives us the opportunity to prevent a asteroid strike). But when a system as large as the climate goes haywire, I don't know that any level of economic health is going to last very long. So I think we have come to very different perspectives on where the "safest" place to be sitting resides. Frankly, I believe that "global warming type-problems" demand a fundamental reevaluation of how society makes decisions, especially with regard to how we evaluate of risk, and where we place the burden of proof. Think about it.... CO2 is one of the most innocuous, harmless, naturally abundant molecules that exists. If you were to propose a substance to drive world-wide catastrophe, this one would seem laughable. And yet, there is indisputable science showing that human activity is now driving sufficiently large changes in CO2 concentrations, that we may destabilize the world climate. We have become something like a bull in the china shop. You can argue that the climate scientists are wrong... and we haven't irreversibly damaged our climate stability yet. But you can't really deny that we're close to the edge. The basic mechanism of action is scientifically well established. Furthermore, you can't deny that these unexpected industrial side-effects are become are becoming a worrisome pattern for humanity. Hole in the ozone layer, anyone? Indeed, despite our modern concerns for sustainability, we still haven't dropped our dreams for exponential economic growth. I don't know if these two concepts are compatible. This is not a Malthusian argument, but a concern about scales of risk and warning times. As economic activity scales up, so do the occasional screw-ups. Historically, these screw-ups were regional, and didn't have global consequences. However, we have now entered a period of globalization, and we are deploying new technologies at ever-increasing rates. Look at how quickly 90% of the US food supply went to GMO products... even when scientific debate on their safety is far from settled. When the next big problem arises... it can occur globally and virtually overnight. There will be nowhere to migrate when things go wrong. Thus, it will become imperative to adopt some serious policies of "first do no harm" and "look before you leap". And, J-man, I wanted to make clear that I almost always appreciate your contributions to conversations such as this. You always provide a unique perspective, and often cause me to think about things differently. Even if I do disagree with your conclusions. The reason I chose to mention you, personally, in my posting is because I think you've made points that are worthy of response. And I don't necessarily think these discussions are a waste of time. None of us individually may appear to have very much worldwide influence. However, society (like the climate) shows the properties of a complex-non-linear system... the long term consequences of this debate are not easy to predict. @Clem - the statement I object to is "I'm not a denialist... I just don't care." If you are a self-preservationist, as you seem to be, then declaring that you "just don't care" in the face of a possible existential threat is logically equivalent to denying that it is a possibility. Since you can't prove it isn't a possiblity (as you have admitted), you are obliged to either accept it or deny it. Insisting that you don't care means you don't care if this possible threat becomes a reality, which is to say, you don't care if your existence is compromised. I would suggest that your position is more accurately summed up by the statement "I don't know what to do with the knowledge that there is a possible existential threat, so I'm going to carry on as before." @blegg: your comments are informative, persuasive, and your tone and style much appreciated. It would be great if it were more broadly imitated. I'm not a denialist, I'm agnostic, but willing to accept that climate change has happened and could continue to happen. I could take satisfaction (if I cared) that my carbon footprint is reasonable when compared to the average American, although inferior to many here (though quite possibly not by a lot.) But, as I see it, the greatest threat to my own survival is not climate change. I will survive OK. And my progeny (should I have some) I expect will be OK, too. I am confident in the power of human ingenuity to solve problems, as long as we continue to provide the infrastructure for it to flourish. But, at one point, there will be an existential threat to human survival from whatever source, anthropogenic or not. And when that day comes, if we as a species are marooned on this planet, it is game over. Is this a pie in the sky fear? No. It is inevitable. All things equal, as a member of the human race, I want us to survive and achieve our highest purpose. Somehow, being bipedal terrestrial reality TV watchers doesn't strike me as our best final stage of development. I want eudaimonia on a species level. Retreating is not a way to achieve this. I, for one, will burn my boats and bridges, in order to make it clear to everybody that I have no hankering after home. No, and I didn't ask you to speak for all libertarians. I asked you to identify specific flaws in that guy's reasoning - you had already told me you disagreed with it. Have I fallen through a rabbit hole into that Monty Python sketch in which Graham Chapman wants an argument and John Cleese is only willing to contradict him without developing any kind of case? You introduced that issue of nomenclature to the discussion - if you didn't want to potentially have to defend what you said, you should have refrained. I take it you aren't eager to defend "homophobe' as a term that doesn't belong in civilised discourse. It seems to me that if in illustration of your desired general point, at least half, possibly more, of the first, presumably strongest possible set of examples you came up with are ones you aren't willing to defend, your general point may lack validity. Perhaps this is uncharitable of me but no one is forcing you to write comments here without thinking them over before you click "Add to Discussion". jj has contributed exactly one comment, which I interpret as being entirely flippant. randy is presumably busy keeping his children from freezing to death or being eaten by wolves. Or perhaps he has no stomach for engaging further. I have responded to EricW but he doesn't appear to want to wade in again. I think that leaves you as the only person active in this thread I can argue with unless I want to start raising very minor points on which I disagree with people who are on my side of this debate. As to whether debating this here is entirely pointless, it may be. Perhaps I'm just enjoying the novelty of arguing online about climate change with someone who isn't faceless and anonymous. It may be, apparently like bshields, I just don't see the humour in admitting to ignorance about a potentially existential threat to human civilisation but nevertheless insisting on arguing that nothing should be done to address it, at least not urgently, just because you have a Panglossian faith in human ingenuity. Aren't you in the midst of people who need to hear this? Puzzling. Are you suggesting I go down and picket outside Capitol Hill? Or seek audiences with Republican Senators and Representatives who are deniers of anthropogenic climate change and try to impress on them that they ought to be responsive to my concerns as a non-voting, non-citizen who doesn't live in their state or district rather than to the people who vote in GOP primaries, who are just as ignorant of climate science as you are, if not more so, but convinced they've seen through the lies of mainstream climate science? At least arguing on AttackPoint I'm only wasting a little bit of time, not a lot of time plus shoe leather. Arguing on attack point might be a waste of time, but trying to understand the position of those with a differing perspective might not be. I am interested in understanding the various strands of libertarianism, particular in its interactions with utilitariansim (probably the closest description of my position). What really intrigues me is the belief that liberarian policy will outperform utilitarian policy even when judged by utilitarian benchmarks. Such a position can generally only be held if one is impervious to evidence. Its much like the climate debate. BTW the population graph I posted above really wasn't that hypothetical; in 2014 we are more than half-way across that graph. And the 343 000 000 Americans it "extrapolates" for 2020 doesn't seem like such a stretch: the US Census Bureau counted 308.7 million in 2010...which falls right on the line. That chart also seems to be saying that the projected growth is largely due to immigration rather than the birth rate. It's not babies, it's people like jtorranc and the wives of chitown and j-man moving here. Not that it really matters where somebody lives, it's all the same globe. The US population explosion is because this is a desirable place to live. (And as far as I'm concerned, I don't have any more right to be here than anybody else, just because my ancestors decided to sneak in a little over a century ago.) Forget that population graph, use a relevant (global) one to make your point. @blegg write "scientists 30 years ago were so concerned about global cooling!!!". That statement simply isn't true. It is a myth. These statements were not part of the scientific literature at all. The only mention of global cooling were articles in magazines and not scientific journals (e.g., a 1975 Newsweek article titled ""The Cooling World"). It is incredible how often this statement that blegg wrote is mentioned in newspaper and denialist blogs today. As is nicely summarized at the link below, global warming actually dominated the scientific literature in the 70’s back then as well. So isn't it alarming that the US also has one of the fastest-growing populations in the world? We need both an Immigration Policy...and a Population Policy if this country is to get serious about controlling our carbon emissions. @Hammer - you're exaggerating. From Skeptical Science's basic level rebuttal to the myth that the majority of scientists in the 70s were predicting global cooling - "The fact is that around 1970 there were 6 times as many scientists predicting a warming rather than a cooling planet.". There were papers in the scientific literature in the 1970s discussing/endorsing the possibility of global cooling - they were vastly outnumbered by papers anticipating warming but they did exist. 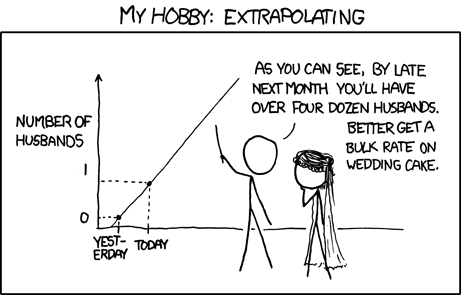 I'm curious - is part of this issue the use of "whole numbers" to represent variability? Let me see if I can show this somewhat visually. But these single values don't seem to show the variability involved. While Mary leans towards No, but isn't sure. @JT: yes it appears I was. So lets reword that original statement to "SOME scientists 30 years ago were so concerned about global cooling!!!". The fact that so much research (as demonstrated by the link you sent) has gone in to find these few publications (not all global and not all natural causes mind you) shows just how effective the repeated use of '"global cooling" has been used by deniallists to sway public opinion. @J-man wrote "So what is this all about?" Well as a scientist, researcher and educator I would argue it is about educating the general public on climate science and as blegg nicely summarizes above the huge risks of ignoring climate change. There is a lack of knowledge on climate science and the cost to society of that ignorance is large. To solve a problem ones needs to first identify and accept that there is one. If we all didn’t care (like you have stated) then we wouldn’t be prepared for the issues that climate change will (and already is) causing. @J-man wrote “I am confident in the power of human ingenuity to solve problems”. I agree 100%. But I would argue that the human ingenuity is already there to solve the climate change problem by reducing our carbon energy intensity. We have lower and zero carbon emission energy sources already. The cost to make that change to those energy sources will be trumped by the cost of not making that change at all (through increased health care costs and extreme weather related costs) OR/ the cost differential will increase the longer it takes for serious carbon intensity reductions to begin. That is mitigation. The other area where human ingenuity helps is in adaptation. Increasing individual resilience to decrease one’s vulnerability to climate change is easy if you only care about yourself and if you have money, but adapting to climate change gets a lot more complicated at a municipal or national level. Who pays for impacts on infrastructure, ecosystem services, food supply? Obama’s $1B Climate Resilience Fund announced yesterday is an example of federal adaptation to climate change. Is that the best use of taxpayer’s money? I'm not an economist so can't answer that question (heck I'm still waiting for an answer to J$'s question above) but for policy makers to make those decisions on costs of mitigation and increasing adaptation costs they need a range of expected climate change projections. As blegg nicely stated above "global warming type-problems demand a fundamental reevaluation of how society makes decisions, especially with regard to how we evaluate risk"
There has been some confusion regarding climate model predictions in the current and previous threads. The (many) climate models are used to model future projections based on a number of different emissions scenarios and/or socioeconomic scenarios. Here is an example from AR4 report from 2007 (sorry I couldn't find the link for the current report being released this year). Those letters and numbers on the right represent the different socioeconomic scenarios. The grey bars represent the range of model outputs (which may satisfy some of @nobbs' concerns about individual model justification) for each of the scenarios. The projections provide policy makers a range of options with an assigned uncertainty. When those uncertainties are assigned it becomes a prediction/forecast. Downscaling those range of temperature and precipitation changes to national, regional and municipal scale climate-mediated impacts increases that uncertainty even higher. The uncertainty may be enough for people to act or for others to dismiss the science and not care. Speaking of not caring. Part of me really shouldn't care what people on Attack Point think about climate change. But for me personally I probably wouldn't have gone into environmental science and be examining the effects of climate-mediated disturbance on ecosystems if it wasn't for the sport of orienteering. Orienteering has had a big influence on me and my love of the outdoors. So perhaps I get more involved than I should when I see people not caring about climate impacts on nature. Perhaps IOF should change their motto from 'One with Nature' to 'Some of us are one with nature and some of us don't give a sh*t". ;-) I joke. But seriously earlier this year I promised myself I wouldn't get involved in debates like this which are summarized well with this all to familiar xkcd cartoon. Having said that as an environmental scientist that examines the effect of climate mediated disturbance on ecosystems I believe that we (as a sport) should be having discussions on how increased extreme weather and ecosystems impacts are having on (and access to) our 'natural arenas'. For example, the Williams Lake Orienteering Club could speak to this given the devastation of interior BC forests by mountain pine beetle. Here in southern Ontario many of our local conservation areas close now on the ever increasing number of high wind and flooding days. There will be more threads on examples of the effects of increased extreme weather events like the Slovenian Ice Storm thread. In games of prediction, isn't it best to be the bookie? Who cares what is going to happen - argue about that all you want - the bookie prepares for any outcome (by adjusting the odds he'll pay out) and survives and even prospers regardless. I thought this was just the gratuitous midwinter friendly bickering thread, in which some people pretend to be on the other side of the issue because the real people who feel that way aren't on Attackpoint. Maybe we should have picked some other topic like mandatory gun ownership. I note that Hammer deleted his response to AZ's post, so perhaps he's no longer reading this thread. But I'm afraid I'm not as optimistic as he and j-man. Because unfortunately few of those "low carbon energy sources" are worth much in terms of their NET energy output. To understand, the ratio of ERoEI must be calculated...Energy Returned over Energy Invested. This ratio is figured without consideration of any monetary costs; it IS the "bottom line." Some sources require very little energy to tap into them, and deliver huge quantities easily; some net very little after all the energy expended to find, develop and tap them. For example, strip-mined coal is just shoveled up and burned to produce 80 times more energy than it takes to develop the strip mine; whereas the Canadian tar sands only deliver 3 times the energy expended to mine, extract, refine and ship. And when you add in the energy required to build the XL pipeline infrastructure...and a portion of the steel mill that makes the pipes....aren't you Canadians just producing a lot of pollution that nets us nothing? So we can have all the ingenuity in the world...but unfortunately the "clean and easy" energy is rapidly disappearing. Note that it takes FOUR TIMES more energy to deliver a gallon of gas from recent petroleum discoveries than it did just 25 years ago. Wind and photovoltaic look pretty good on that chart. Especially if the energy invested comes from wind and/or photovoltaic. Although the chart doesn't specify one important thing: over what time period is this considered? You burn some coal, and the coal is gone. But a windmill keeps on turning. Is it over the expected mechanical life of the windmill? We're not going to be using up the wind, or the sunlight. Those numbers ain't the bottom line, quite. Wind power in large quantities requires storage, and storage isn't efficient. So if you have large amounts of wind energy, the 18 might drop to 10 or some such, I don't know. And as for whereas the Canadian tar sands only deliver 3 times the energy expended to mine, extract, refine and ship. And when you add in the energy required to build the XL pipeline infrastructure...and a portion of the steel mill that makes the pipes....aren't you Canadians just producing a lot of pollution that nets us nothing? Nope, three times a lot of energy is a lot of energy, and pipelines presumably are not much less efficient than shipping, otherwise why would they be built. Four times a very small percentage is still a relatively small percentage, so I wouldn't care much about that. But four times four times is starting to get somewhere, and we may be there sooner than we would like. Thanks to ctc,jman,blegg et al for all the fun. This is really a good thread. Unfortunately, as I am currently using an iPad, a product of human ingenuity more oriented towards consumption than producing, I'm only consuming. But, props to all here for both interesting facts and some compelling personal testimonies. Please carry on. I need to regird myself to tilt with the Dark Knight. jjcote: Maybe we should have picked some other topic like mandatory gun ownership. But, as I see it, the greatest threat to my own survival is not climate change. I will survive OK. And my progeny (should I have some) I expect will be OK, too. The perfectly realistic possiblity that, to take one example, millions of Bangladeshis might starve to death or become refugees because sea level rises enough to make it impossible to farm where they currently do is notably absent from your threat assessment, j-man. Also, regarding being willing to burn your boats and bridges in a quest to spread humanity beyond a single planet, a pro tip - it generally works better if you do it after the body of water is crossed, not before. Most people also settle for burning the boats and bridges and don't insist on reducing the home they left behind to a burnt cinder as well just to show how committed they are. Right, but what sort of welfare economic framework do you think I subscribe to that would cause me to care? I think we need to call for a truce. Clearly, we have different views about distributional economics that are intractable. How much of my argumentation here has really said anything about science? When have I impugned climate science or disputed your facts and figures? I think I am clearly disputing the policy prescriptions, much as I would dispute most progressive recommendations about anything. That shouldn't come as a surprise to anyone here. I still don't know why I should be called a denialist. Anyway, back to semantics just for a moment… why in English don't we call someone who doesn't like women a gynophobe? I guess I often fail at some things because I come at lots of issues from a conceptual analysis framework. I tend to know more than many about words. But, I don't know that much about all the relevant literature. Weinberg has provided a number of informative interviews that help to elucidate how he came up with his famous term. Such as here. Clearly, he is a clinician and knows his stuff, so I can appreciate some of the arguments. And certainly he is not responsible for how the term he coined became used in subsequent years. But, can you deny that this word, and in our current debate here, 'denialist', is used to political ends? Or, is it possible that everyone who is labeled a 'homophobe' to make a political point fits the clinical definition? I find that hard to believe. It strikes me as a word that has been coopted, and is being misapplied--intentionally or not--when a different term would be more generally relevant and true to English convention. Again, the denialist thing irks me. Unless this is another term that has been coopted to political ends (and has a backstory that the in-crowd knows intuitively, but I do not) I don't think that describes me. Yep, no point arguing the science or the policy until we understand the ethical frameworks each brings to the "debate". I have trouble understanding how any ethical framework could be unconcerned about the Bangladeshi example, but I accept such might well exist. If anyone holds to such a position, climate change evidence is irrelevant. I think its more honest to not care and not argue against the climate science, than to be a "denialist". Might as well get back to orienteering discussions. Over the millions + years of the its existence the earth's continents have changed, its oceans have changed, its polar access has changed, its magnetic field has changed. So why should anyone be surprised that the earth's climate zones change/ shift as well? I've spent most of my life living in an area that 20,000 years ago was covered in a sheet of ice over a kilometer thick and 10,000 years ago covered in a great sea of melted ice. The earth's climate (and its topography) has to have changed to now produce one of the most habitable areas on earth. Limiting industrial and machine CO2 emissions is a laudable goal. However to promote that it will stop or even significantly affect global climate change patterns or stop the 20,000 year pattern of a disappearing polar ice cap is just plain fraud. Exercising and eating well is a laudable goal. However to promote that it will stop or even significantly affect death is just plain fraud. So why do you exercise and eat well? @gordhun Just think, 500 years ago you had no earthworms. ...If a ridge of high atmospheric pressure develops off the California coast, it can easily push moisture-bearing winds to the north, so that the water falls closer to Seattle than Sacramento. Just such a ridge has been parked off California for much of the last three years. A decade ago, scientists published a tantalizing paper that predicted a greater likelihood of such a ridge. The lead researcher ran forecasts of what would happen in a future climate after a substantial melting of sea ice in the Arctic. The ice is already melting because of fast-rising temperatures in the region that many scientists attribute to human emissions. They said the loss of ice has allowed extra heat to escape from the Arctic Ocean into the atmosphere, disturbing weather patterns over vast distances. That, they said, has made extreme weather events of all kinds more likely in the Northern Hemisphere, possibly including winter extremes like the cold blasts hitting the East Coast these days. I don't know - there are no doubt many to choose from. Do you in fact subscribe to a welfare economic framework in which you have no duty of care to avoid doing things the predictable consequences of which will harm other people? "I am very proud of being the one to have coined the word. I remember the moment in 1965 when it came to me with utter clarity that this was a phobia. I was preparing a speech for a homophile group, which set me to thinking about "What's wrong with those people?" By "those people," I had in mind that day a few therapist friends who had liked a gay friend of mine, spoken well of her until I told them that she was a lesbian. Hearing that, they didn't want me to bring her to a party, as if she was a contaminant. " "Homophobia has never been listed as part of a clinical taxonomy of phobias, neither in Diagnostic and Statistical Manual of Mental Disorders (DSM) or International Statistical Classification of Diseases and Related Health Problems (ICD); homophobia is usually used in a non-clinical sense." In sum, I don't know what you're talking about with your apparent claim that the word is being grossly misused in common practice rather than properly according to its clinical definition. May I suggest we don't call people who hate women gynophobes simply because, perhaps for no other reason than random chance, misogynist was coined first? - I disagree that you've been disputing policy prescriptions. I think it is much more accurate to say you've been trying to cast doubt on the idea that any policy response should be undertaken. If you agreed a policy response was required and devoted your energy to making the cases for one response or set of responses and against another, that would represent considerable progress from your current style of argumentation as performance art. - Are you asserting that some special set of rules applies to words used for political ends? Where are these rules written down? By whose authority are they promulgated? - I'm still waiting for you to identify specific problems with Breunig's premises or reasoning. I'm not going to believe you can until you actually do - call me skeptical. Killing the open italics tag and missing div tag. I am disappointed Jon. No, not random chance. Because the term actually originated in ancient Greece, where you could count on them to know how to use their language. Don't worry, gynophobe exists, and its meaning is exactly as you'd expect. Anyway, why on earth do I need to critique Breunig's arguments? You and Hammer referenced him, not me. Do I have to fight the minions here and your angels in heaven, too? That is why environmentalism is such a huge problem for libertarians, and it is no doubt why so many of them are skeptical of the effects of climate change or other environmental issues. Admitting that someone’s use of their own property almost certainly entails an infringement on someone else’s property makes the whole libertarian position basically impossible to act out in the real world. That is the conclusion right? Are libertarians skeptical of the effects of climate change? I honestly don't know. I don't spend any time reading their writings or conversing with them. Do you? Why do I have to defend them, too? Anyway, there seems to be a problem in the logical structure. It is redolent of the illicit minor fallacy, although maybe not exactly. There are a whole host of reasons someone would be skeptical of the effects of climate change, but his post falls far short of the standards of logical proof. Do you in fact subscribe to a welfare economic framework in which you have no duty of care to avoid doing things the predictable consequences of which will harm other people? OK. Yes, your carbon footprint is probably smaller than mine. I have no idea. Because it is somewhat smaller you are a saint and I am a sinner? How have you managed to do such a great job minimizing your impact on other people so that you can flit through life like a demigod? I breathe. I defecated. I defile the planet and harm other people. But, so do you. Misogynist? I thought that the English term for men who hate women was the girl with the dragon tattoo. I have to wonder, if the weather were to get really bland, would that get blamed on global warming, too? I'm not saying that we're not having weather phenomena that are caused by increased CO2 levels, but you can't just point to arbitrary weather events and say, "See?". The policy debate isn't about whether anyone shits. Its about the need or otherwise for coordinated market and regulatory signals in recognition of the spillover effects we all contribute to, and in recognition of the improbability that voluntary change based upon moral argument will make any difference. Think of it much like the use of taxes to pay for shared sewerage systems. When it's cool he wants it hot. He always wants what it is not. I do not see any good reason to get emotional here about this really trivial issue, what would happen to climate in 50-100-200 years. Who cares. Modern civilization will collapse much sooner, from depletion of fossil fuel reserves, well at least those with reasonable extraction cost. America particularly is doomed. Every little town with 20 thousand of population is spread on the area of half-Moscow. That fine movie I recall, The Road, or something ?, that’s the future. There were weather events in the past, and there will be weather events in the future. Clearly the "weather event?" binary metric is not going to get you very far. The theory is that as global warming ramps up, the weather will fluctuate more. So the more relevant thing would be to measure the weather variance, or perhaps to look for changes in the frequency domain. For example, it's supposed to rain a little bit more, on average (because there's going to be more water (instead of ice), and the temperature increase will make more of it water vapor), but it will rain less frequently and in larger amounts, and in different spatial patterns. Consequently our current inability to predict things like freak ice storms will be more costly, because the storms will be more frequent, and often more violent. It will be harder for farmers to plan their water usage, and more of their crops will be destroyed by storms, so your food bill will go up. Or maybe you will even run out of food, just as many people have run out of salt of late. Of course we will continue to do battle with mother nature, but it will require better preparedness than we are used to. So, even if you have no moral dilemma in burning fuel and so forth, shouldn't you at least plan for a changing climate? Precisely because it's not fun to be huddling in the cold during an ice storm? The attitude that it's all very complicated and questionable so don't tell me this storm is a sign of global warming, etc., doesn't yield a high level of preparedness. Meanwhile IL, this may or may not have anything to do with climate change, but are you involved? Any Canberrans out there care to tell us if the rock garden has been mapped? We have enough rocks here so we give them away to unfortunates like Canberrans. With enough donations they might be able to make a good map. For those that care, I'm confident Yurets point to Mad Max 2, The Road Warrior above. I note that ken has "archived" the first 75 posts to this thread; a "show" button at the top gives access. I hope we're not jeopardizing his server with this important discussion. And try as I may, I cannot find randy's several long posts, either on this or the Slovenian Ice Storm thread. So I guess he has thought twice, decided he was wrong....and deleted his contributions. Has he, in fact, seen the error of his denialst ways? Are the denialists turning tail and running? Does this mean we've won? Yes, we have saved the world, no need to worry any longer. FYI, the "archiving" thing is automatic on long threads. Good idea ken....thanks! A lot of needless scrolling has been eliminated. And on another note, is there ever any "censoring" of these general discussion threads? Even when some of the comments might be taken as personal attacks? I for one, would never ask for censoring. We don't HAVE to post here, and thus become targets for disagreement and personal attack. We do so willingly. As Harry Truman used to say, "If you can't take the heat, stay out of the kitchen!" OK. Yes, your carbon footprint is probably smaller than mine. I never assume that an AGW alarmist has a small carbon footprint. Threads have been deleted, or at least hidden, in the past, and rightly so. Most discussions on AP are remarkably civil, but there have been unpleasant exceptions. Huge potential for that, even at the tiny personal level. I've been off-and-on looking at solar charging for backpacking for some time, and while there are a couple of solid products out there now, it would be superb (and I would certainly pay a premium) to cut the weight or size in half, or double the output (I would prefer the former, particularly the size). @Mr Wonderful: I have too much respect for jtorranc to conflate him with Al Gore. However, I may not give such benefit of the doubt to my other foes ;) They may not have as much rectitude or ethical capacity. In any case, in all religious debates, hypocrisy abounds. BTW, no one is ever "wrong" when dealing with disparate, self-dogmatic axiom sets; that's how clueless most posters in this thread are, but, whatever. We are both right, Clark, but at least the data is consistent with my axioms. In any case, all I can say is that I turned my thermostat up from 68 to 72, and I think of you every time a CO2 molecule wafts from my furnace into the atmosphere :) Have a nice day. I fish for spears and brickbats and my friends oblige me. I fail to see why you're disappointed. Looking at your Gynophobia link and the equivalent page for Misogyny, gynophobe does indeed exist but is a fairly recent coinage from Greek roots, apparently in a clinical context, whereas misogynist is authentically Ancient Greek in origin. In what way does this contradict my conjecture that misogynist may dominate in current English usage, imprecise though that may be compared to the glory of Ancient Greek, for no deeper reason than that it had a head start and then the advantages of incumbency? "Do you in fact subscribe to a welfare economic framework in which you have no duty of care to avoid doing things the predictable consequences of which will harm other people? " I know you were aware of that since you quoted the entire question as the introduction to your response. I think I've being quite clear that I don't subscribe to such a framework, i.e. that I do think you, me and everyone else on earth should feel obligated to try to avoid harming other people, wherever they may happen to live. Please could you give a straightforward answer to the question? If you respond in the affirmative, delving into the details of your framework could be enlightening (because I, frankly, find it incomprehensible how you could reject the Golden Rule - Wikipedia says the Ancient Greeks, for instance, were very big on it). If you respond in the negative, then we're basically on the same page on the ethics of this and then perhaps it would be productive to skip over discussing the inadequacy of any possible attempts you or I might make to reduce our personal environmental impacts and instead discuss how public policy could address the negative externalities you admit may well be associated with fossil fuel use. Is that too much to ask - a public policy discussion without you (and randy, earlier) reacting to the idea that our lifestyles may have to change to avoid bad things happening in the future as though it were a personal attack? In theory most of us will subscribe to that Golden Rule. In practice we all overlook it in much of our daily consumer life. Some to a greater extent than others. You may take this as a personal admission of a degree of personal hypocrisy. I doubt none on this thread is free of this condition. If we accept this, then we can move on to the need for public policy intervention to limit our hypocrisy if as a collective we believe the situation is important enough. Yes, I would like to hear an answer to Jon's question, not as a personal attack, but out of curiosity. Perhaps it will lead to a discussion about the balance between utilitarianism and libertarianism. My personal ethical framework is given structure through Kant, particularly the Groundwork of the Metaphysic of Morals. But, of course, one could say that this is indeed a recapitulation of the so-called Golden Rule, which itself is explicitly stated in my personal religious tenets. As for a welfare economic framework--the closest I have to such a thing can be found in Hayek. I will allow you to let me know how either of these are internally inconsistent or are inconsistent with one another. In any case, however they may enjoin me to live my personal life, they do not allow me to impose on others how to live theirs. as though it were a personal attack? Ceding my rights at the barrel of a gun or under the duress of facing the censure of legion would be a personal attack. A personal challenge would be to be hectored, often in a supercilious or bizarrely officious manner to explain myself, defend myself, defend my alleged co-conspirators, and/or defend myself against the arguments of the external Greek chorus. As I do repeatedly attempt to appeal to reason, the efforts are demeaned as being "argumentation as performance art." Sigh. But, this strikes me as the way a trial in a place where there is no rule of law would work, so maybe it is good practice. Finally, I suspect Randy (retreating under perceived unfair criticism of his lifestyle) and me, reminded yet again that some lifestyles are more equal than others, find the irony of these statements rich. That is mostly too complex for me to understand, with the exception maybe the mention of Hayek, a man who (in my opinion) made claims of the utilitarian benefits of his philosophy without presenting much in the way of evidence. But that is the way of the Austrian school. As a research psychologist by training, my perspective is probably predictable. I started this thread because I wanted to get the irrelevance out of the Slovenian forest thread. Starting from a position of mild displeasure, I veered towards bewilderment as the thread progressed. I remain in that state. I appreciate that you started the thread and your measured, constructive questioning. Your professional background is especially relevant as this has devolved into something genuinely bizarre. As I am partially, but by no means exclusively, responsible for this, I apologize to you. • this cute video about some of the purely personal reasons not to have kids...while avoiding future Americans' massive carbon footprints on the surface of our Earth. In theory most of us will subscribe to that Golden Rule. In practice we all overlook it in much of our daily consumer life. Some to a greater extent than others. You may take this as a personal admission of a degree of personal hypocrisy. None of us have infinite time in which to thoroughly investigate every single thing we buy to determine whether its production or eventual disposal might produce consequences sufficiently adverse to outweigh the benefits of consuming or owning it. Asking you to explain your thinking is beyond the pale? In a discussion forum? No matter - enough derision from me, however deserving or undeserving various things that have been written here may be of it. The attempt at closure isn't especially helpful to those of us who haven't read Kant or Hayek and lack time to anytime soon but I'm weary enough to abandon trying to understand your worldview. If there's anything specific you raised in our back and forth that I haven't addressed which you would like me to, please identify it. Otherwise, I'm disengaging. I am also weary, so I am also disengaging. However, I was hoping someone would have commented briedly on this one before I climb out of here. I can come up with my own rejoinder, but others here are more capable. Maybe my concluding comment [other than that the link above doesn't work for my browser]. I can accept a libertarian position that values freedom of choice over a utilitarian goal of maximising our community well-being [you can call this an economic welfare framework if you must]. I can't agree with it, but that is different. I can accept and generally agree with a utilitarian ethical position of maximising welfare [you can use the word utility instead if you must, but I will debate what this actually means]. I cannot accept claims of the utilitarian benefits of a libertarian policy without the support of evidence. This is not a matter of values but of debatable fact. This is why I have little respect for Hayak. Wishful thinking at a crucial moment in history won him a Nobel Prize. My motivation in all my posts was to try and disentangle value positions from contestable positions. I did start this thread with the aim of hijacking with slovenian forest discussion, but that failed miserably. In regards to the cited article, here goes (I don't know what the general availability is from the link above, but the article is also available from the author's website if anyone has difficulty accessing it). The article attempts to quantify historical levels of atmospheric CO2 based on something called the Ginkgo Stomatal Index. Basically, people have observed a relationship between CO2 levels and the incidence of stomata in Ginkgo leaves*. In particular, as CO2 levels increase, number of stomata decrease. The data establishing this relationship exists over a range of CO2 levels from 294-800ppmv, and for a range of GSI from ~6.5-14%. This data is plotted in Fig. 3 of the paper. 2. The relationship itself is prone to error at the low GSI / high CO2 end. This can be understood from Fig. 3, in which two different hypothesized functional relationships are superimposed on the data. The difficulty in extrapolating this relationship to lower GSI / higher CO2 levels is clear. Basically, the GSI/CO2 slope is very very tiny, so the error in predicting CO2 from a small change in GSI is huge. The error on the slope itself would also appear to be significant, as evidenced by the two different curves. In any case, the indications seem to be that historical levels were high, even if there is much uncertainty as to exactly how high. I would argue that the fact that levels of 2000ppmv are correlated with mass-extinction events is a cause for concern, given that by the end of the century we are expected to be at ~50% of that level, and that the errorbars on 2000ppmv are also pretty high. In regards to the second thrust of the paper, which seems to be to determine a correlation between CO2 levels and overall temperature and wetness, I don't think we can take away much in regards to weather. Climate, yes, but not weather. Nothing in his data makes any reference to severe weather events, only average wetness and temperature. So... is that what you wanted to know? * - "Stomatal index is the number of stomatal openings as a percent of epidermal cell plus stomate numbers"
** - actually, eq. 1 seems to have GSI^7.93 in the numerator, but that would not agree with the data, so I assume he made a parenthesis error. *** - if so, then it's really questionable to extrapolate up to those CO2 levels. **** - The author claims, "the standard error of this relationship (±37 ppmv)" (in reference to eq. 1). It's not clear what that means. Look at the two curves in Fig. 3 and tell me they don't differ by 1000s of ppmv CO2 at low levels of GSI. Yes, excellent. Thanks. Signing off. What need? Lead by example. This is like my friend who always argues that I should be taxed into oblivion to pay for some program but he never opens his checkbook. As if orienteers are reproducing at a rapid rate anyway! What havoc you seek to wreak on junior development. Clark is just hoping to cut down on the number of lazy young upstarts who are paying for his medicare benefits. Contributions from the "young upstarts" so far not needed. Medicare & Social Security programs have made money on me; my paycheck deductions many years ago, were much more than I've received so far, when even the most modest compounding is considered. Thanks to my a/p exercise log I hope to keep it that way. And thank you bshields for the link to that 15-page paper supporting the reality of Global Warming and your humorous summary above. The graphs in the paper (p.1451) showing huge projected increases in temperature and rainfall by 2100 are certainly sobering. What is life going to be like with 50% more rain, snow and ice? Mr Wonderful. That makes no sense to me at all. Tax is about opening both yours and your friends cheque books if you collectively agree the cause justifies the measure. I can't see any other answer to his free-rider behaviour. @TIL, you can't reverse hijack. You have to forward hijack. Inishbofin is one of Ireland's finest orienteering venues. For some inexplicable reason everyone else on earth doesn't slavishly imitate my lifestyle choices. If they did, no one would own a car and CO2 emissions would therefore be lower. Also, everyone would be vegan. These facts lead me to believe that leading by my personal example isn't a sufficient response to major societal problems. It was also a clue when I refrained from killing anyone for my entire life to date and the murder rate didn't fall to zero. @Ndobbs. 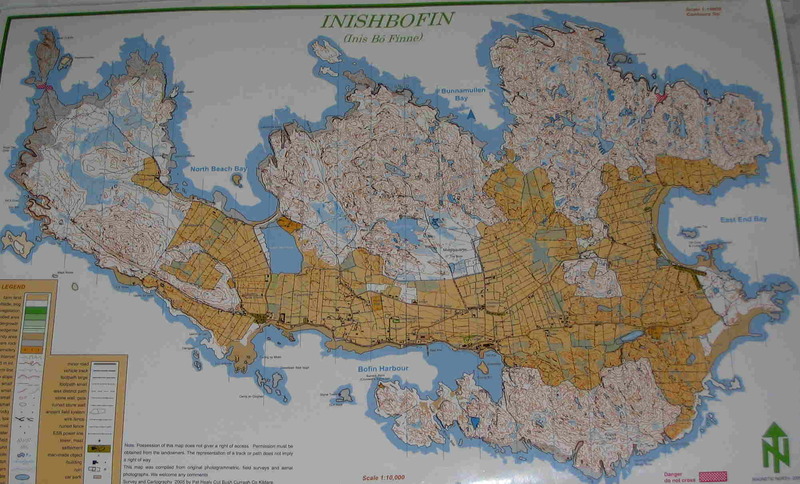 Perhaps you can post a link to a map of the best terrain at Inishbofin. There are a couple of palm trees on the island, but the white is open. I am curious as to the course setting strategies used to link the areas of obviously interesting terrain. Also, is there a map of Craggy Island or Rugged Island? I hear the local inhabitants are quite amusing. You can get a reasonable longish distance out of the two northern chunks. It's not the only island to be mapped, http://omaps.worldofo.com/index.php?id=2780 for example, with one of the longer cliffs you will see on an orienteering map. It'll take a while to be submerged by rising sea levels, too. Seriously ndobbs? You want to put a long-distance course on that map? At a scale of 1:10,000? Those beaurocrats over in IOF will probably try to organize some mass-start world-cup race there, just cause it's easier to set up TV cameras without the trees around. Don't even get me started on the blurry stacked-formlines. Has anyone used Parochial House as a sprint venue? If not, is there any risk this iconic cultural structure will be submerged by sea-level rise in the near future. How long can we wait? The House is safe from inundation, unless maybe a new turlough pops up. Relax, TIL, and have a cup o' tea. What's the largest island that has been fully mapped to ISOM standards? Anybody have any nominees? Last year during TJOC, we did a 25 control memory O on the island. Great place for that activity. If memory failed, you had to run back to a master map. Newcastle Island in Nanaimo harbour, British Columbia is about 4 1/4 square km. There must be larger islands mapped in Scandinavia. @jjcote. Possibly one of the Stockholm Archipelago Islands. Lidingö Hittaut map would be an example. Interesting project that lead to the map is described here. A couple of copies are sitting on my desk in faraway Australia and I quite enjoy wasting time looking at them. Folded out they could be called a small tablecloth. Parts of the map can be seen here. I think Stordøya, Norway, was mapped couple of decades ago(?) That would make something like 500..600 km2. Older ISOM standard of course.